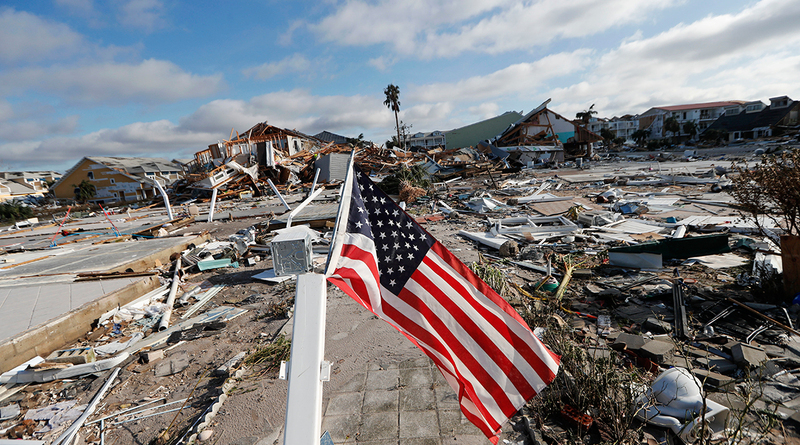 PANAMA CITY, Fla. — The devastation inflicted by Hurricane Michael came into focus Oct. 11 with rows upon rows of homes found smashed to pieces, and rescue crews began making their way into the stricken areas in hopes of accounting for hundreds of people who may have defied evacuation orders. At least two deaths were blamed on Michael, the most powerful hurricane to hit the continental United States in nearly 50 years, and it wasn’t done yet: Though reduced to a tropical storm, it brought flash flooding to North Carolina and Virginia, soaking areas still recovering from Hurricane Florence. Under a clear blue sky, families living along the Florida Panhandle emerged tentatively from darkened shelters and hotels to a perilous landscape of shattered homes and shopping centers, beeping security alarms, wailing sirens and hovering helicopters. Some of the worst damage was in Mexico Beach, where the hurricane crashed ashore Oct. 11 as a Category 4 monster with 155 mph winds and a storm surge of 9 feet. Video from a drone revealed widespread devastation across the town of about 1,000 people. In Panama City, most homes still were standing, but no property was left undamaged. Downed power lines lay nearly everywhere. Roofs had been peeled off and carried away. Aluminum siding was shredded to ribbons. Homes were split open by fallen trees. A man outside Tallahassee, Fla., was killed by a falling tree, and an 11-year-old girl in Georgia died when the winds picked up a carport and dropped it on her home. One of the carport’s legs punctured the roof and hit her in the head. As of 2 p.m. EDT, Michael was centered about 25 miles south of Greensboro, N.C., with winds of 50 mph. It was moving northeast at 23 mph. Forecasters said it could drop up to 7 inches of rain over the Carolinas and Virginia before pushing out to sea by evening Oct. 11. In North Carolina’s mountains, motorists had to be rescued from cars trapped by high water. More than 375,000 people along the Gulf Coast were ordered or urged to clear out as Michael closed in. But it moved fast and intensified quickly, and emergency authorities lamented that many people ignored the warnings.